New 675LT borrows from maker’s racing heritage. McLaren put out another teaser today for its 675LT coming to the Geneva Motor Show in March. McLaren’s run the gamut in the last 12 months going from a company near its demise to now a company introducing new products. The maker dropped a hint that it’s bringing another new vehicle to the Geneva Auto Show, just a week after it announced it teased it’s new 650S. The British sports car maker recently revealed it will be bringing the production-intent McLaren P1 GTR to Geneva, but today a new video featuring just a wheel spinning spitting out water as classical music plays in the background appeared. Traversing the land of fire and ice. 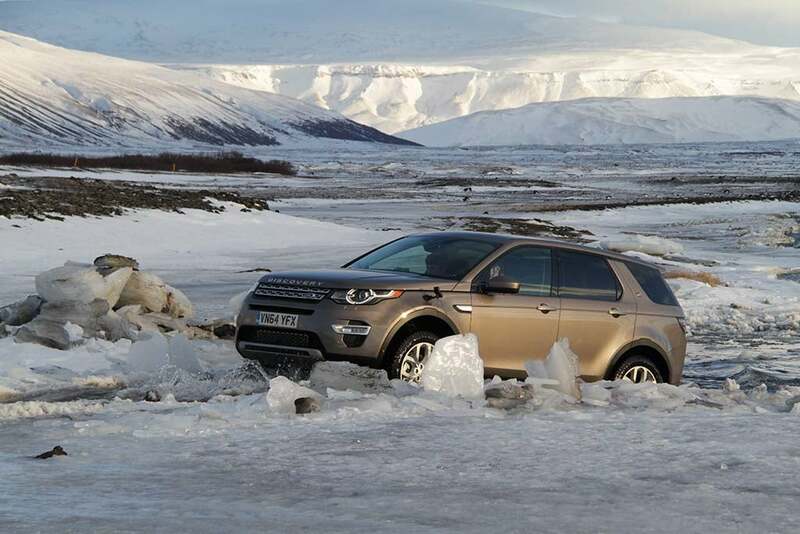 The 2015 Land Rover Discovery clambers out of a frigid Icelandic river crossing. Legend has it that the ancient Vikings attempted to mislead potential invaders by naming an inhospitable spit of Arctic turf Greenland. Discovering its frozen wastes, the logic seemingly went, they’d steer clear of the even more dismally named Iceland. Visitors to the capital city of Reykjavik unfailingly find the humor in this tale – until the polar winds descend, as they did earlier this month, howling in windswept gusts approaching 100 miles an hour. 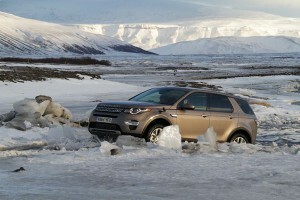 But it was precisely the sort of weather we had come looking for as we clambered into the new 2015 Land Rover Discovery Sport, steering our way along the frozen coast and then heading into the interior of a volcanic island used as the backdrop for some of the most desolate winter scenes from the popular TV series, Game of Thrones. The Disco Sport, as it is commonly called, is the latest in a series of new products to emerge from the British maker’s design and engineering studios in recent years. With the top-line Range Rover family essentially complete, Land Rover is working on the second leg of its three-segment stool, the Sport being the first of several Discovery models to come. Maker also cuts forecast for full fiscal year. 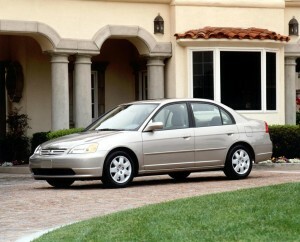 A 2002 Honda Civic. One of millions of Hondas equipped with suspect Takata airbags. Honda earnings took a sharp tumble during the most recent quarter, hammered by a variety of problems including the maker’s airbag recalls, as well as sluggish sales in its home Japanese market. The maker announced the 15% decrease in net income a day after it said it received reports of two more drivers, including one in Houston, who may have been killed by flying debris caused by the explosive malfunction of its airbags. Honda has been forced to recall millions of vehicles using the supplemental restraint systems produced by supplier Takata. It also had to fix problems with its new Fit subcompact. Analysts have estimated the recalls have cost Honda about $255 million, or 30 billion yen – though the maker did not break out details. Cigarette Racing hints at GT S-inspired concept. Mercedes-AMG and Cigarette Racing are teaming up to introduce a new concept at the Miami International Boat Show next month. The Mercedes-AMG product setting hearts aflutter may not be the new AMG GT S, but it’s marine twin that will make its debut in Miami in two weeks. Courtesy of a partnership with Cigarette Racing Team, many of Mercedes’ AMG beasts have equally powerful marine cousins. 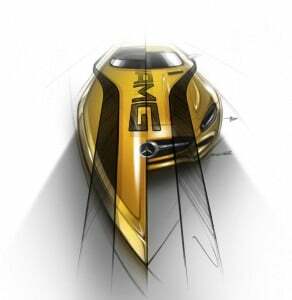 In the case next week, it will unveil its 50-foot long Maurader GT S concept at the Miami International Boat Show. Is Cuba A Hidden Trove of Classic Cars? Collectors developing barn fever as US-Cuba relations thaw. The rusted hulk of a Mercedes-Benz 300SL Gullwing Coupe found in a Cuban yard. Anywhere you wander in Cuba you might feel like you’re caught in a time warp, if for no other reason than the steady stream of half century-old Chevrolets and Fords that dominate the communist country’s roads. They’re the automotive equivalent of “zombies,” suggests Ken Gross, one of America’s foremost experts on classic cars. “They’ve gone on far longer than they were designed to,” patched together with baling wire and anything else that cash-strapped Cuban owners can find. 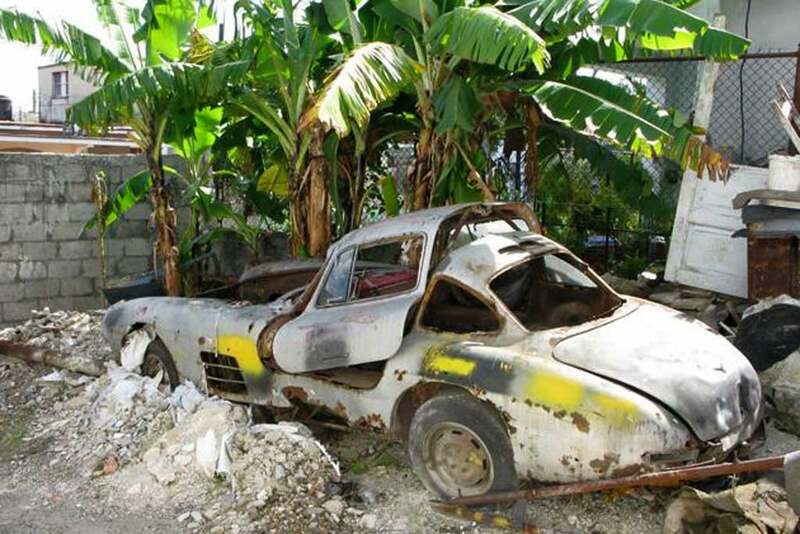 While most Cuban cars are old American hulks, there have been several recent reports of vehicles far more exclusive and desirable, including a pair of rusted Mercedes 300SL Gullwing coupes – vehicles that, in good condition, can command upwards of $500,000. So, with Cuba and the U.S. talking about finally ending the diplomatic standoff that followed the communist takeover, there’s been a bit of so-called “barn find fever” incubating among classic car collectors. Makers invest in plants despite slowing economy. Shanghai GM invested more than $1 billion in a new plant in China's Hubei province and expanded other facilities in the country. 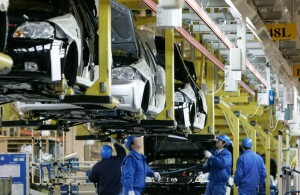 Despite the fact that China’s economic growth has slowed, General Motors and Ford Motor Co. continue pushing ahead with plans to expand their production footprint there. Mark Fields, Ford’s chief executive officer, told analysts this week thatFord expects the Chinese economy to grow by 7% to 7.5%, which is ample enough to sustain an increase in sales of new vehicles. Ford expects sales to come in at between 24 million and 26 million units and the automaker, with its Chinese partner, is moving ahead with plans to open two new factories in China this year. Gen-Y auto purchasing power reaches $135 billion. Millennials are starting to buy more new cars, after all, and have increased purchasing power. It’s often said that Millennials have a very different view of the automobile – and a new study suggests they are gaining the purchasing power to reshape the auto industry into their own image. Americans born between 1980 and the late 1990s are expected to account for about 25% of the new vehicle market this year. That means they will generate sales of 4.24 million vehicles, according to data tracking service TrueCar — the equivalent of $135 billion in purchasing power. Talking About The New Generation! Last year’s payout was a record $8,800. 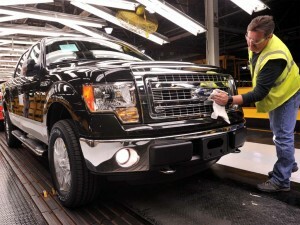 Ford's hourly workforce will see their profit-sharing checks drop by nearly $2,000 this year. Ford Motor Co. will continue to face major challenges in the first half of 2015, but the company’s executives expect better results for the full year after a disappointing 2014. The company’s results fell in line with earlier guidance, but the net income of $3.2 billion for 2014 is down $4 billion from last year. The obvious hit resulting from the lower profits? Profit sharing checks for the company’s more than 50,000 hourly employees in the U.S.
Maker reports profits in line with earlier guidance. 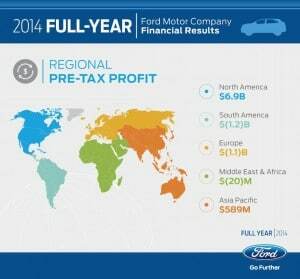 Ford reported pre-tax profits of more than $6 billion for 2014 led largely by North America. Ford Motor Co.’s profits cratered during the fourth quarter as moved through the changeover of the company’s popular full-size pickup truck, dropping from 75 cents per share in the same period in 2013 to a single penny per share in the final three months of 2014. The company’s fourth quarter pre-tax profit was $1.1 billion, excluding special items. That is $197 million lower than a year ago with after-tax earnings per share at 26 cents, 6 cents lower than a year ago. First person to own McLaren P1, Ferrari LaFerrari and Porsche 918. 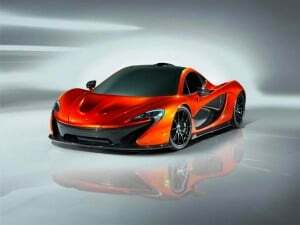 One person has purchased all three of the "holy trinity" of hybrid super cars, starting with the McLaren P1. In the case of British multi-millionaire Paul Bailey, it was a real-life game involving the purchase of McLaren P1, the Porsche 918 Spyder, or the Ferrari LaFerrari: the holy trinity of hybrid supercars.